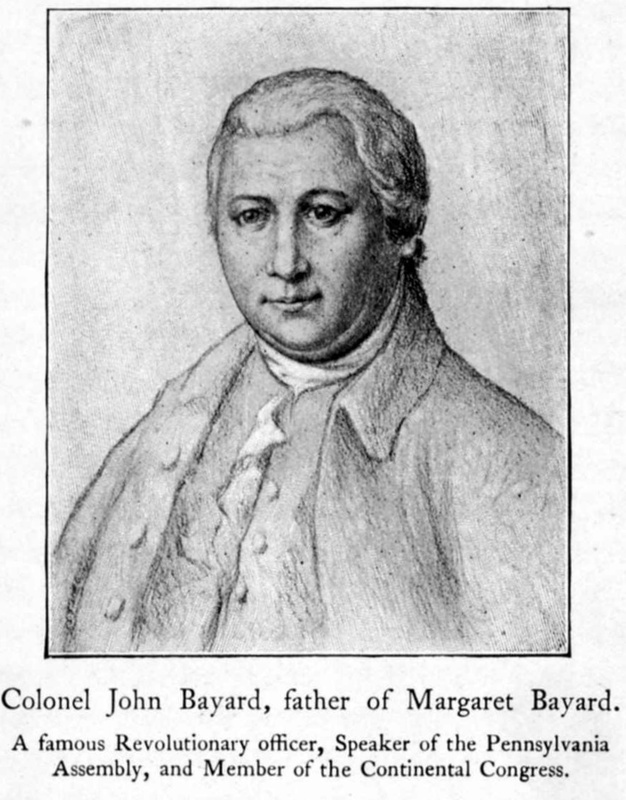 Note: Colonel John Bubenheim Bayard ‎(he dropped the name Bubenheim)‎ was born in the Great House, Bohemia Manor, Cecil Co., Maryland, on August 11, 1738, and died in New Brunswick, N. J., on January 7,1807. He was one of the most distinguished members of this ancient family, holding many positions of importance. He signed the non-importation agreement Oct. 25,1765; was delegate to Provincial Convention, July 15.1774; on Committee of Safety and Council of Safety. He had also quite a military career and was a gallant officer. In 1775 he was a Major of the Second Battalion and then Colonel of Associators and served during a period of two years. He was in the battle of Princeton and was personally thanked by General Washington for services rendered. He was also in the battles of Germantown, Brandywine and Valley Forge. He appears to have served in a military capacity and as a member of the State Board of War until after Dec. 4, 1777. He had a seat on the Supreme Executive Council, Oct. 31, 1781; was Judge of High Court of Appeals, March 15, 1783; member of Continental Congress 1785; removed from Philadelphia, Pa., to New Brunswick, N. J., and became Mayor of that town in 1790, and Judge of Court of Common Pleas. We thus see what a distinguished gentleman he was: Patriot, soldier, and statesman. This is an error, and we would like to fix it. Please report this error to Dan Glass.